You may remember that some posts ago I wrote about Benjamin Poulson, a tailor at 94 Regent Street. Before he started out on his own, Benjamin’s employer had been John Eddels and, in February 1827, Benjamin worked in Eddels’s shop in the Strand. 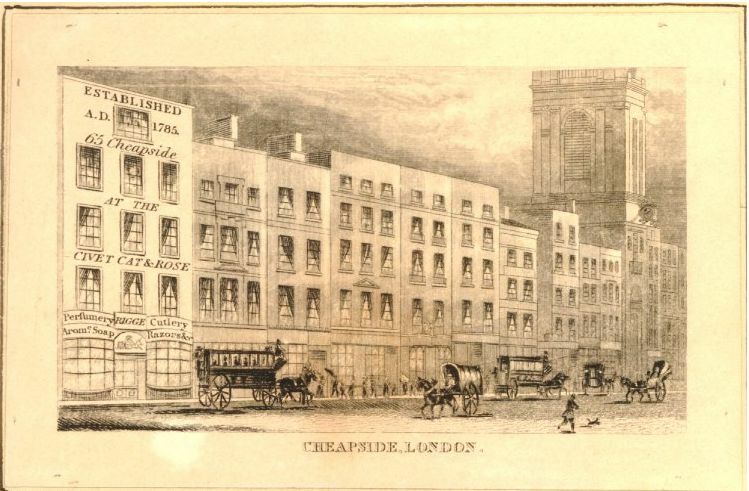 Quite soon after, Eddels must have given up the shop in the Strand, as on 17 October of that same year, he has his will drawn up and only mentions two premises, one at 2 Coventry Street and one at 64 Cheapside. Eddels had meant the Coventry Street property to be sold with the proceeds to go to his daughter and the Cheapside shop to be retained for the use of his widow, but the family decided otherwise and John’s brother James Eddels of 34 Piccadilly, one of the executors of John’s will, took over the Coventry Street shop. John’s widow Mary, with her young daughter, also Mary, did, however, continue the hosiery business at Cheapside. John and Mary had been married at St. George’s, Hanover Square, on 28 February, 1813, but their daughter Mary was baptised on 31 March, 1816, at St. Mary-le-Bow, Cheapside, suggesting the family already lived in Cheapside, although John may not yet have been the proprietor of the shop. 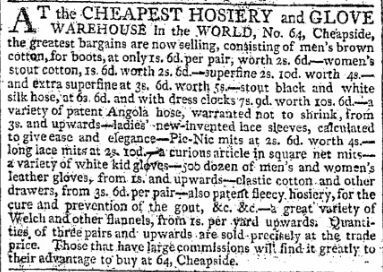 I found an 1805 advertisement for “the cheapest hosiery and glove warehouse in the world” at number 64, but no name is given. And it is only in 1817 that John obtained the freedom of the Company of Framework Knitters by redemption, paying the fine of 46s 8d, suggesting that only then had he become the actual proprietor and needed to be a freeman of one of the City Companies. The following year, a son James is baptised at St. Mary’s, but he probably died young as he is not mentioned in John’s will. Fast forward to 1835, when a burglar managed to steal a piece of silk from the shop through a broken window. Evidence is given by John Kerby who states that he is shopman to Mrs Mary Eddels. (1) The theft is not very spectacular, but it gives us the name of Kerby. Interestingly enough, in the 1841 census, the name of Edmund Kerby is listed at 64 Cheapside. This Edmund married daughter Mary Eddels the following year (12 November 1842 at St. Mary-le-Bow) and on the marriage registration his father’s name is given as John with the occupation hatter. Did the father work for Eddels first and did his son take over? Quite possibly. Edmund obtains the freedom of the Spectaclemakers in 1850, also by redemption, paying the usual fine. Soon after, on 28 July, he remarried Charlotte Pardoe, a widow. Edmund’s address is given as Hampstead and his occupation as ‘gentleman’, suggesting he had given up the shop. 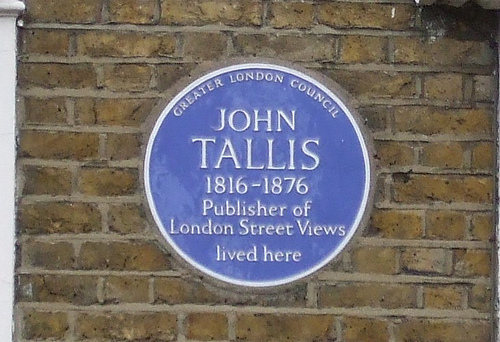 The 1861 census confirms this as he is then given as “retired hosier” at Lanark Villas. Quite by chance, we know what happened to the shop at 64 Cheapside as the neigbour at number 65 was John Bennett, clock and watchmaker. Bennett had an advertisement put in The Daily News of 10 December 1859 in which he annouces the enlargement of his premises. “J. 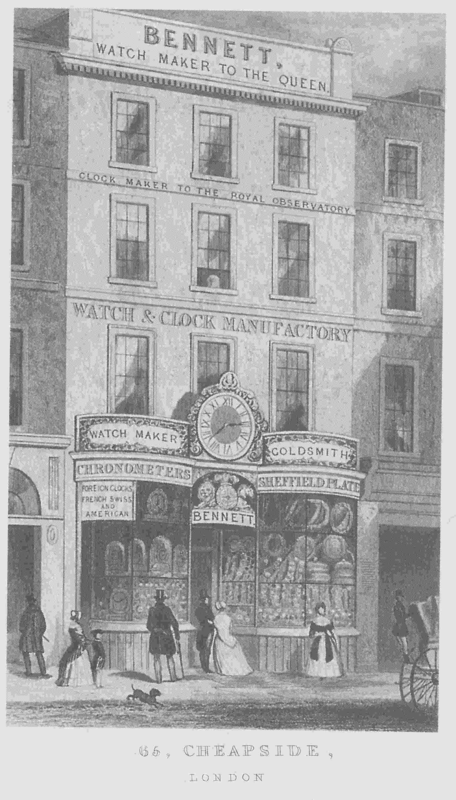 Bennett, finding that the whole of his present premises are required for his watch and clock business, has secured the adjoining house, 64 Cheapside, for the jewellery department of his establishment, which will be opened as soon as the fittings are completed”. 64 Cheapside had been built over the entrance to Crown Court. In the 1839 elevation (top of this post), Crown Court is clearly written in the gap on the left-hand side of the building, but in the 1847 elevation, the entrance hole is no longer given a name. If you look at the vignette which Bennett had in the 1847 Street View booklet, you will see the black hole of the Crown Court entrance with the windows of the Eddels/Kerby property above it on the right-hand side of the picture, just behind the wheels of the carriage. On 23 October 1867, ten years after the death of the Eddels women, a notice from the Bank of England appeared in The Daily News announcing the release in three months time of annuities “in the names of Mary Eddels, of Cheapside, widow, and Mary Eddels of Cheapside, spinster, since wife of Edmund Kerby” to the latter “unless some other claimant shall sooner appear and make out his claim thereto”. No more is heard of it, so I assume Edmund received the money. Edmund married a third time in 1871 to Eliza Kirkes and died in 1879. His personal estate was then valued at under £3,000 and the executors were Thomas Henry Neal, solicitor, and Edward Hemming, a hosier of Cannon Street. (3) And here we come almost full circle, as the Hemmings figure prominently in the will of Nathaniel Keen Eddels, John Eddels’s brother. For Nathaniel’s will, see the post on Poulson. (1) Old Bailey case t18350921-1933. (2) The Morning Chronicle, 16 February 1859, Court of Probate report. (3) England & Wales, National Probate Calendar (Index of Wills and Administrations), 1879.